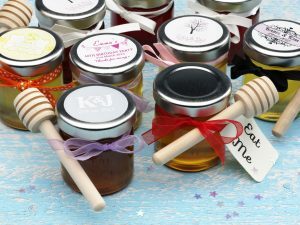 Give your guests a gift to remember with our lovely made-to-order honey favours! As a symbol of love, purity and fertility, honey plays a crucial part in rituals and ceremonies in many cultures and civilisations. 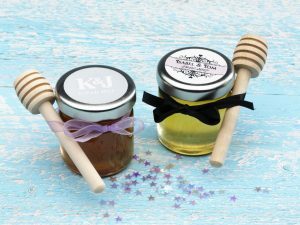 Our 1.5oz /42g honey jars are the perfect presents for weddings, bridal and baby showers as well as birthdays and event parties. For the honey purists, our honey jars are also available as pure Organic Raw Acacia Honey (unflavoured). All our favours are handmade and customizable; the jars come with a selection of twines and ribbons for you to choose from as well as personalised tags to match your celebration and event theme. Mini honey dippers can also complement the favours, for a perfect and stylish finish. We customise the honey jars in accordance with your requirements and we deliver them to you ready to give out to your guests. No hassle and no stress involved. We recommend placing your order as soon as possible to reserve a date on our schedule. As a sustainable and ethical business, we donate 5p for every honey favour bought towards the project, “Adopt a beehive”.